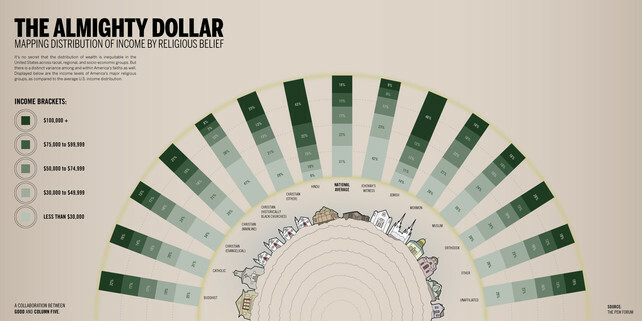 Infographic: How Rich Is Your Religion? Visualizing the wealth of the faithful, this graphic reveals trends in more than just religion. As a born and bred atheist, I don’t know terribly much about the bible, but if you asked me, I could probably summon up a few vague platitudes, like “be nice to your neighbors” and “blessed are the poor.” So, exactly how poor are Jesus’s disciples today? An infographic from GOOD and Column Five demonstrates how religion lines up with income in America, examining how faith and wealth mingle in contemporary society. “It’s no secret that the distribution of wealth is inequitable in the United States across racial, regional, and socio-economic groups,” write the designers at Column Five, a Newport Beach creative agency that specializes in data viz and infographics. “But there is a distinct variance among and within America’s faiths, as well.” Using data culled from the PEW Forum, they’ve organized each population of faithful by income levels. In some ways, this graphic is showing more than just religion, since faith often corresponds to socio-political groups as well. The richest, clearly, are Hindu, a small population in comparison to Christians, who are divided into sectors like Evangelical and Historically Black Churches, which both land at the lower end of the income scale. Evangelical Christians lie at the lower end of the scale. Hindus and Jews are among the higher end. While this chart only shows the money coming in, it would be fascinating to include the average amount of charitable giving amongst each group. A little Internet sleuthing turns up some interesting numbers. For example, Mormons, who are smack dab at the national average in terms of income, are perhaps the most giving–the IRS reports that a majority of Mormons give 7.5% of their incomes. Hindu and Jewish Americans, two of the wealthiest demographics, are also extremely charitable. In some forms of Islam, giving is an expected part of faith–though according to some reports, Bush-era policies intended to stymie donations to “terrorist groups” abroad are stifling Muslim Americans’ high rate of philanthropic giving. According to some statistics, Catholics tend to give less. Other lower-income groups, like Jehovah’s Witnesses, reportedly give by way of community involvement. It’s a fascinating glimpse at how faith matches up with income. Now who wants to be responsible for adding a third axis for party affiliation?